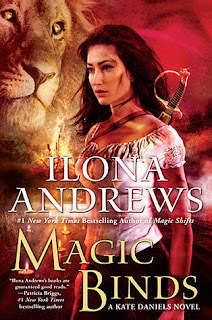 Review: I don't know how the writing duo that is Ilona Andrews continues to do it-but Magic Binds is another winner in the amazing Kate Daniels series. Seriously people-if you are a fan of urban fantasy, please check out this series. Kate is smart, loyal, funny and all-around awesome. I love her relationship with Curran, Julie and the whole crew. While I love Kate and Curran, my favorite scenes were without question those with her father Roland (filled with magical tension and a dash humor) and Roman. Roman is my favorite secondary character in this series and I remember asking the authors (at a book signing a few years ago) if he would get his own book. While this isn't his own book, I loved every scene with him. Christopher also had some great character development in this installment. I only wish there had been more detail in the final scene with Kate and Roland. Overall, great read!